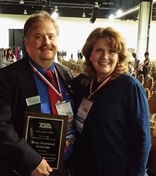 Tony Raymond, the Colorado TSA State Advisor, was the recipient of the 2014 National TSA State Advisor of the Year award at the 2014 National TSA Conference in Washington, D.C. Mr. Raymond is pictured at the left with Dr. Rosanne White, the Executive Director of National TSA. Congratulations Mr. Raymond on this outstanding achievement! Previous Previous post: Battle Mountain HS Wins Solar Race!